A UK report by the Mental Health Foundation, suggests that loneliness is more prevalent among the young than those past retirement age. "Generational differences are striking. In general, the younger you are, the more likely you are to feel lonely often (12%) and the more likely to have felt depressed because you felt alone (53%). More people in the 18-34 age bracket also worry about feeling lonely (36%). 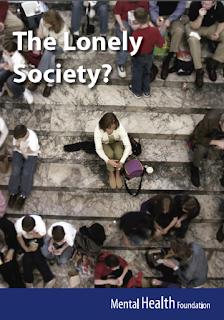 These results may indicate that loneliness is especially a problem for younger generations, and that changes in the way we live and work that affect our relationships are having more of an impact on this age group. More young people (31%) say they spend too much time communicating with family and friends online when they should see them in person, for example. Of the three age groups, people in the younger age group (18-34) were most likely to have been proactive about dealing with isolation, with 14% saying that they had sought help for feeling lonely, compared to 12% of those aged 35-54 and 8% of people over 55." While the connectivity of the new social networking sites and technology in general were seen as potentially 'isolating' experiences and poor replacements for genuine human interaction, the report also acknowledged that it can allow people to make connections they may otherwise never have made. And this inherent dichotomy is captured as a generational experience, with the younger generations falling into the former. Food for thought as many of us deal with, and push for, a more digital environment at work and home.